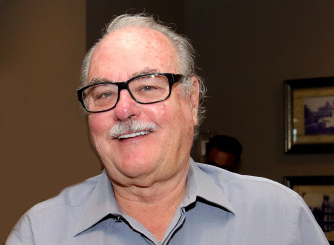 With over three decades in real estate development and with several projects in Miami-Dade County under construction or review, Henry Pino focused his honed eyes to his hometown of South Miami. A drive around the county and you’ll see an Alta Developers banner on the construction fences. Just down the road from South Miami is the old Poe’s site, which was acquired by Pino with an assemblage of adjacent properties. 420 apartments and 20,000 square feet of retail are proposed for this site. Another is the One Paraiso (with Related Group), a chic high-rise condominium with 53 floors and 276 units of contemporary italian-styled apartments. Six other residential projects are in Miami downtown, Doral, Boynton Beach and Fort Lauderdale. 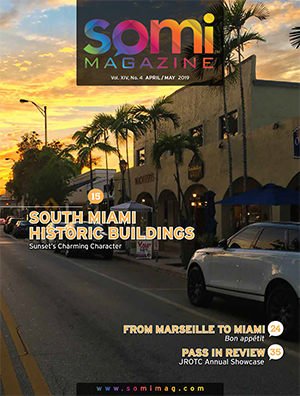 A resident of South Miami for the past twenty-four years, he and his wife Patricia O. Espinosa, raised their two daughters in South Miami and frequent our Town Center Shopping and Dining District often. Later working his father-in-law who owned a construction company he convinced the family to invest in some property and build garden apartments. He then teamed up with Willy Bermello and Luis Ajamil to form BAP Development and they worked their way into the condo boom of the early 2000s. In 2004, he decided to go out on his own and formed Strategic Properties Group. And with significant investment in Miami real estate coming from South America, the condo market was again on the rise. Pino formed Alta Developers with his Chilean partner Raimundo Onetto. Funded by five family investment groups, their money allowed Pino to move aggressively in acquiring property. 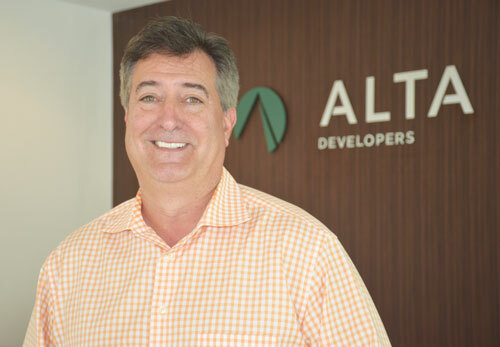 Alta Developers has teamed up with major developers such as the Related Group, Terra and Greystone. And in the downtime of the condo market, Henry worked on the patent for an environmentally friendly dispenser for household products, a project he developed with his daughter Gabriella. (See below). Henry Pino is an environmentally conscious man. He has been in the chemicals industry since 1993, when he created a company to help hotels, hospitals and restaurants reduce their stockpile of chemical drums by refilling them with his fleet of tanker trucks. He later founded Environmental Solutions Group (ESG) to achieve a real and positive impact on the environment – reducing plastic waste on a massive scale by providing the same refilling capabilities to anyone with the EcoPod system, as well as other eco-conscious innovations. His daughter Gabriella, ever since learning about ocean pollution at a young age has made it her personal mission to create greener solutions on a global scale. As an undergraduate student at NYU’s School of Professional Studies, Gabriela focused her coursework on current environmental issues and potential solutions. The Zero Waste concept resonated with Gabriela and she found ways of incorporating this lifestyle. While participating in a beach cleanup along the shorelines of NYC, Gabriella noticed the debris along the coastline was seemingly endless. She witnessed the devastating effects of microplastic pollution firsthand and realized that she needed to do more to help. The idea for EcoPod Kiosks was born. Since 2010, ESG has been dedicated to the invention, enhancement, and distribution of simple station-based answers to many of life’s most common problems. 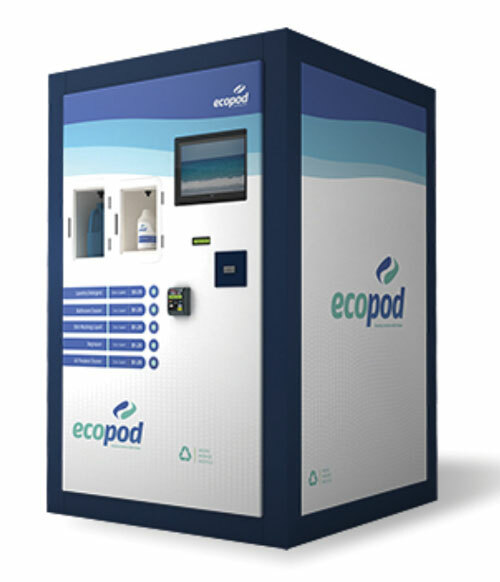 EcoPod and GeoPod are both innovations led by a team of leading market visionaries from fields such as consumer goods, sales, logistics, and customer relations. ESG products offer the unique advantage of benefiting both product owners as well as end users. 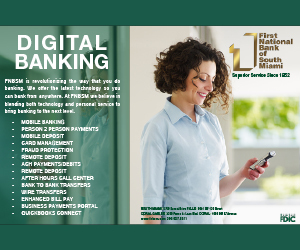 Owners appreciate the self-contained, virtually maintenance – free aspect of the kiosks, which presents excellent return on investment in a short period of time. Likewise, end-users and consumers appreciate the easy-yet-effective convenience that ESG’s products offer – simplifying their lives and often creating value in their day-to-day budgets. The property selected for his first hometown project is a 1.6-acre parcel that has frontages on SW 72nd Street, SW 61st Avenue, and SW 71st Street; and makes up approximately one-half of the block. Currently, it’s developed with a 20,371 sq. ft. multi-story office building and surface parking lot. Henry saw this as a great opportunity for his next mixed-use project anchored by residential units. “The site is under-utilized and we need places for people to live,” he said. They will be demolishing the existing structure and build a multi-story building. 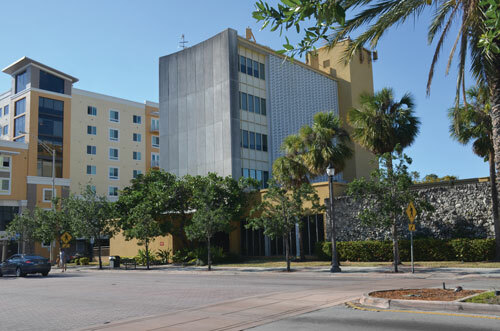 Commercial space, consisting of 3,678 square feet of restaurant and 2,441 square feet of retail uses, will be located on the ground floor of the Sunset Drive facade, and wrap around the corner of the building to also face onto SW 61st Avenue. A total of 203 residential units will be located on the upper levels of the building and the ground floor level of the northern portion of the building. The unit mix consists of town homes, studios, and one-, two-, and three-bedroom units of varying sizes. 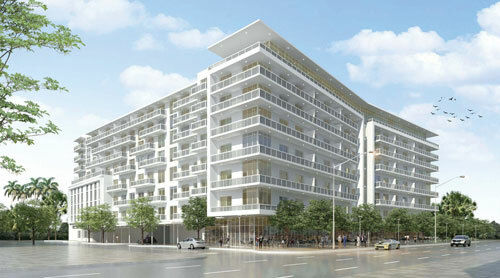 The building will be eight stories in height along Sunset Drive and step down to fifty-two feet along 71st Street. Plans call for a canopy of trees and plaza setting along Sunset Drive for outdoor dining. “History was made tonight!” exclaimed Commissioner Josh Liebman to Henry the night of April 3, 2018, when the City Commission unanimously approved (5/5) the project. It is anticipated that construction on the project will commence at the end of the frist quarter 2019 after site demolition. Yeah, but, you know, none of those 203 units is destined to be “Work-force” or “Affordable” apartments. Our South Miami workers – the ones who staff the stores and restaurants, the ones who clean and maintain the hospitals, i.e. the non-professionals – will still have to commute to get to their jobs. The whole plan is lovely, except for the lack mentioned above.